CenturyLink has unveiled its Dynamic Connections, a Layer 2 (L2) based offering that provides access to many different cloud computing services. The third biggest U.S. wire-line carrier has partnered with Amazon Web Services and AWS GovCloud, saying it will add connections to Google Cloud and Microsoft Azure in coming weeks, then will add IBM, Oracle and other cloud computing services. With growing day-to-day operations, organizations need a fast and easier way to connect their locations and data centers to cloud service providers. CenturyLink says they offer a complete portfolio of solutions for cloud connectivity. The company’s global access and extensive wavelength, Ethernet and IP VPN connectivity options are designed to meet today’s hybrid cloud requirements. CenturyLink says they will provide high-performance connections to AWS, Microsoft Azure, Google Cloud, IBM Cloud, Oracle Cloud Infrastructure, and other leading public and private clouds along with more than 2,200 third-party data centers. Dynamic Connections is available to enterprise and government customers in fiber-fed buildings globally. CenturyLink has about 130,000 of those today, via an optical Ethernet port. According to CenturyLink, the customer needs the right hardware and the right size port, but assuming that, they can turn up bandwidth from “as small as 10 Megabits/sec to up to 3 Gigabits/sec,” says Paul Savill, senior vice president of core network and technology solutions at CenturyLink. Savill said that competing multi-cloud connect offerings –from AT&T’s NetBond, Verizon’s Secure Cloud Interconnect and Orange Business Services’ private and public cloud connections, etc. “can’t match our scale and flexibility.” [There is also Equinix Cloud Exchange Fabric]. As a L2 service, it doesn’t touch the Internet, which thereby provides greater security. In addition, CenturyLink is offering an open API for the service so that enterprise customers can build it into their own back-office systems and use those for provisioning instead of the portal. After CenturyLink acquired Savvis in 2011, the combined company attempted to promote its own cloud computing service using MPLS IP VPN for customer access to it. This new multi-cloud connect service is a huge improvement over that earlier solution. It will be interesting to see how it competes with AT&T Netbond, Verizon’s Secure Cloud Interconnect service, and Equinix Cloud Exchange Fabric. CenturyLink maintains the top spot in Vertical Systems Group’s (VSG) mid-year 2018 U.S. Carrier Ethernet Services Leaderboard. AT&T, #1 in 2017, claimed the #2 spot, followed by Verizon, Spectrum Enterprise, Comcast, Windstream and Cox. All of the companies maintained their year-end positions. The leaderboard ranks incumbent telcos in order based on U.S. retail Ethernet port share. VSG calls this an industry benchmark for measuring Ethernet market presence. 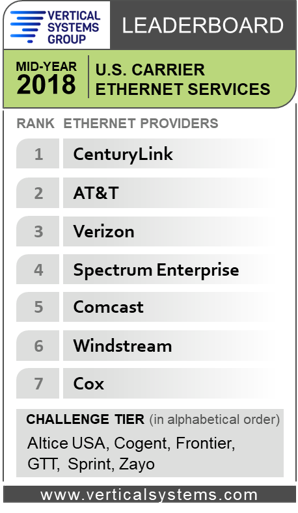 CenturyLink’s acquisition of Level 3 Communications, along with continued growth in Ethernet ports for both companies, allowed it to power its way to the top of the year-end ranking. Other providers selling Ethernet services in the U.S. are segmented into two tiers as measured by port share. The first, or challenge tier, includes Altice USA, Cogent, Frontier Communications, GTT, Sprint – which is attempting to merge with T-Mobile – and Zayo. The second or Market Player tier includes all providers with port share below 1%. Companies in the Market Player tier include the following providers (in alphabetical order): Alaska Communications, American Telesis, BT Global Services, Cincinnati Bell, Consolidated Communications, Crown Castle Fiber, DQE Communications, Expedient, FiberLight, FirstLight, Fusion, Global Cloud Xchange, Great Plains Communications, Hawaiian Telecom, Logix Fiber Networks, LS Networks, Lumos Networks, Masergy, MegaPath, Midco, NTT America, Orange Business, RCN Business, Tata, TDS Telecom, Telstra, TPx Communications, Unite Private Networks, US Signal, Vodafone, WOW!Business and other companies selling retail Ethernet services in the U.S. market. AT&T is not the only U.S. carrier attempting to provide broadband fixed wireless access to rural areas. CenturyLink has requested an experimental license from the Federal Communications Commission for a test to reach isolated rural areas via a fixed wireless service over the 3.4 GHz to 3.7 GHz spectrum band. The trial is aimed to evaluate the use of wireless spectrum to provide broadband services to those rural areas where it’s difficult to make wire-line infrastructure/facilities available. “The testing seeks to understand the viability of new technologies in this band,” CenturyLink wrote in an FCC filing. “CenturyLink seeks confidential treatment for the Exhibit on the basis that it contains confidential commercial information, technical data and trade secrets concerning CenturyLink services under development and related testing processes, all of which CenturyLink customarily guards from public disclosure,” CenturyLink said. Besides the 3.4-3.7 GHz bands, CenturyLink is looking at how it might work with other network service providers rolling out future 5G wireless networks. Glen Post, CEO of CenturyLink, told investors during the Goldman Sachs Communacopia Conference in September that it would be open to such partnerships to accelerate the speed at which it is rolling out service to rural areas under the CAF-II program. CenturyLink joins several other rural-centric providers like Frontier, Consolidated and Windstream are seeing similar potential. As we’ve previously noted, AT&T’s rural wireless broadband recently added 9 more states. Frontier confirmed it was conducting tests of how it can use fixed wireless to address the broadband availability problem in very rural areas via the FCC’s CAF-II funds. Frontier joined Consolidated and Windstream in a joint FCC filing (PDF) related to a request to create flexible use of spectrum bands between 3.7 and 24 GHz. Consolidated and Windstream also expressed interest in being able to use 3.7-4.2 GHz band spectrum for rural fixed point-to-multipoint deployments, such as through the rules proposed by the Broadband Access Coalition. – Revenue for the quarter fell 7.0% to $4.09 billion, which was down from $4.40 billion last year. – Continued to invest to drive higher broadband speeds throughout its network footprint. 1. Year over year (y/y) decline in Carrier Ethernet revenue, yet solid growth in (older) MPLS revenue is quite puzzling. 2. 10.1% decline in enterprise legacy services revenues due to lower voice and low-bandwidth data services revenues. broadband units. Consumer legacy revenue declined 8.8% Y/Y – lower access lines. 1. Enterprise strategic revenues (not including co-lo sales) grew 4% while high-bandwidth data services revenues increased 5% Y/Y. 3. Operating expenses for consumer segment declined $47 million, or 7.4%, Y/Y – lower employee-related expenses. Most astonishing to me was that the Century Link executives did not even mention their public cloud computing business, which was heavily promoted in 2011 when the company acquired Savvis. We assume the company’s entertainment video business results were included in the consumer segment, but they were not separately disclosed. “We are confident our continued investment in high-quality, high-bandwidth broadband network infrastructure positions Century Link well for long-term growth,” said Glen F. Post, III, Century Link chief executive officer and president. “Enterprise demand for high-bandwidth data services remains strong and, while consumer broadband units were weaker than expected, we are encouraged by the higher-value customers our improved offerings are attracting. We accelerated our capital investment in high-bandwidth services and broadband infrastructure during the second quarter, which we believe better positions us to increase revenues in the second half of 2017 and beyond. We anticipate second half and full year 2017 capital expenditures of approximately $1 billion and $2.6 billion, respectively. “We achieved our expected adjusted EBITDA for the quarter as our employees did a great job managing costs, while core revenues were below our expectations primarily due to the decline in legacy revenues and the decline in broadband units being higher than anticipated. We continue to make good progress in obtaining the necessary approvals for the pending Level 3 acquisition, having received clearance in 23 of 25 required states and territories. Integration planning is progressing well and we continue to anticipate completing the acquisition by the end of September 2017. We remain excited about the value we believe this transaction will create for our customers, our shareholders and our employees,” concluded Mr. Post. Based on first half 2017 results and current expectations for the remainder of the year, Century Link anticipates coming in slightly below its full-year 2017 revenue and adjusted diluted EPS guidance, primarily driven by higher legacy revenue declines and lower consumer broadband revenue growth than anticipated. The company continues to expect adjusted EBITDA and adjusted free cash flow to be near the lower end of prior guidance. Century Link is not providing updated guidance ranges for full-year 2017 due to the pending acquisition of Level 3, currently anticipated to be completed by the end of third quarter of 2017, and the expected consolidation of results for the combined companies in fourth quarter 2017. First, we continue to outperform MPLS market growth projections forecasted by leading industry analysts. In second quarter, we had nearly 2,000 MPLS customers. This performance was driven in particular by our SMB customers, where we are seeing improved install intervals of nearly 20%, which should help accelerate our revenue recognition as we move into the third and fourth quarters of this year. Next, we launched a number of new products and – we’ve launched a number of new products in the past few months including our CenturyLink Ethernet service. We’ve also had three simplified bundles of SD-WAN plus network packages. We rolled out a competitively priced cloud-enabled small business VoIP offering. And we rolled out a new comprehensive managed Enterprise offering that is an end-to-end solution that includes WiFi management, network management, video surveillance, security and mobility management, all from a single interface. Also we have increased focus on customer retention and we are seeing lower credits and adjustments as a result. In addition, CenturyLink continues to be one of the leaders in network virtualization through the deployment of software-defined networking and network virtualization capabilities. Based on initial results, we expect these services to create significant value in the months ahead. Also the continuous onslaught of new security threats, such as WannaCry has brought greater interest in and sales of our strong network and cyber security capabilities, as we believe CenturyLink is growing in recognition as a leading provider of security services that are so important to our Enterprise customers. And lastly, based on third-party research support, U.S. Enterprise high-bandwidth data services are forecast to grow at mid-single-digit compounded annual growth rates through 2021, and U.S. Enterprise Managed Network Services are forecast to grow at mid to upper single-digit compounded annual growth rates through 2021. Now this forecast gives even more confidence in the opportunity to continue to grow Enterprise business in the months ahead. Second, our IT services revenue, which is primarily driven by IT consulting, cyber security, IT service management and big data and analytics, is growing. And our managed hosting business also showed a solid turnaround this quarter. The team overcame the market confusion and sales disruption created by the colocation sale and grew cloud revenue, especially driven or aided by our Cloud Application Manager suite. Next as expected, we had a seasonally challenging quarter from consumer broadband subscribers approximately 65,000 residential subscriber loss was higher than anticipated. This was driven to a great degree of our stronger cable competition, particularly 1 gig offerings in some of our key markets, coupled with aggressive pricing. Over the past year, we have made a pivot towards higher-quality, more profitable consumer broadband sales by removing several low-priced promotional offers and increased credit standards.